The original credits, then 76 Totter’s Lane and the Coal Hill School begin the episode as they began the series. 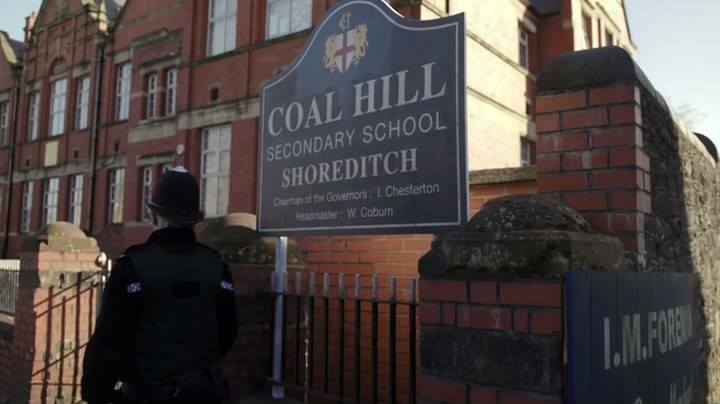 The school sign reads “Headmaster: W. Coburn” and “Chairman of the Governors: I. Chesterton” … Anthony Coburn wrote that episode, “The Unearthly Child.” Ian Chesterton was a teacher at the school and the Doctor’s companion…he might even still work there. The clock Clara motorcycles past shows the exact time the Unearthly Child was broadcast. And she writes No More on the whiteboard. Hmm…. They don’t dwell on the bit where Clara has met Hurt and Ten before during her splintering into souffle girl adventure, but that could just be confusing and awkward. Smith hanging from the TARDIS mirrors his own first episode The Eleventh Hour. Both times dramatic and fun. 11 wears Amy’s reading glasses. 10 wears his own “cool” glasses. “Reverse the polarity” is the Third Doctor’s line. The fangirl is wearing 4’s scarf of course. She also uses it as a weapon, as he frequently does. Zygons hail from the 4th Doctor and Sarah adventure “Terror of the Zygons” (in which people dramatically back up when menaced by them, as in this one). This is their first New Who appearance. Clara uses Jack Harkness’s vortex manipulator. River Song presumably has a different one. Elizabeth the First and 10’s courtship and wedding (teased in several episodes) are finally shown. Even the War Doctor uses a gun to shoot the wall, not the enemy. The sealed message from the past, paintings as messages, etc, are seen in “The Pandorica Opens,” among others. The escape from a dungeon scene nods to many moments, especially 3 and Jo scenes. The oft-mentioned Time War described by 9 and 10 is shown. Gallifrey and the Time Lords’ terrible collars. Also their vault of doomsday devices. The fez of “The Pandorica Opens,” itself a nod to the fez 7 wears, returns (many times over!). Even 10 wears it. In “Night of the Doctor,” 8 meets the sisterhood of Karn from “The Brain of Morbius,” toasts his audio adventures companions, and transforms. Earth is doomed to fall to alien invasions, a nod to many many episodes. The Moment comes to life with a personality very similar to the TARDIS of “The Doctor’s Wife.” They’re both even wooden boxes. In UNIT, Clara sees a cyberman head and a wall of old companion photos, starting with Susan’s. River’s red sparkly high heels are also there and Amy’s “Angels Take Manhattan” pinwheel. John Hurt regenerates, noting he’s “Wearing a bit thin,” the words 1 used on changing to 2. 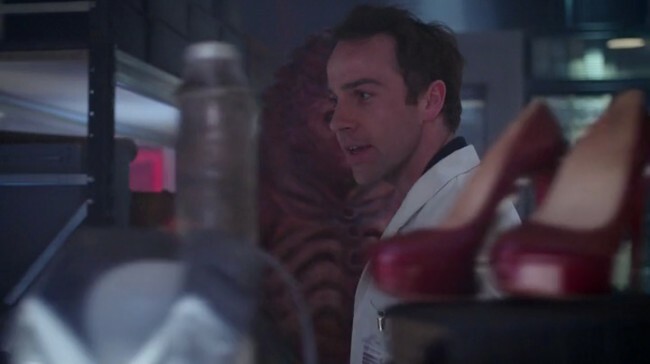 This show uses several of Moffat’s signature loops and paradoxes. Obviously, “The Three Doctors,” “The Five Doctors” and “The Two Doctors” all dealt with the same sort of paradox and snarky comments towards the other Doctors’ dress, mannerisms, etc. It’s no wonder 10 isn’t shocked to see 11 after all that. This one particularly mirrors The Three Doctors, with the old crochety one complaining about the ridiculous clown and the “cool” charmer. In fact, that was a Brigadier episode, as this is a Brigadier’s daughter one. 10: “I don’t want to go.” 11: “He always says that.” 10’s last words on the show are…still his last words. 11 warns 10 about SPOILERS! for the future…by this point in Ten’s life, he’s met River and heard her catchphrase in the Library. On the Doctor getting kissed: Hurt: “Is there a lot of this in the future?” 11: “It does start to happen, yes.” A reference to the asexual attitude of the first seven Doctors in contrast with New Who. “They’re getting younger all the time,” Hurt notes (though he thinks 10 and 11 are companions). Eleven has the same phone number as Ten had in “The Stolen Earth.” Seems he still has Martha’s phone. The Tardis is switched to its original white circles décor. The museum had a similar wall pattern. “Is it important?” “In twelve hundred years I’ve never stepped in anything that wasn’t.” This actually seems a parody of Eleven’s Christmas Carol line that he never met a person who wasn’t important. While the latter was sweet, the former just seems silly. Kate wants a file from the seventies or eighties. It’s murky when UNIT events of the Third Doctor era happened as they were meant to be in the near future (80s), not the present (70s). Hence the date. The end credits, with the Doctors’ faces, is reminiscent of the old style. Kate Stewart, daughter of the Brigadier from 3’s era (also seen in “The Power of Three”) and UNIT. Their Tower of London base was also in “The Power of Three” There’s a picture of her father and the Doctor sends a “space-time telegraph” for him. The code 11 scratches into the wall is the time and date Unearthly Child aired. 17-16-23-11-63, and the first Doctor Who episode aired at 5:16 p.m. on November 23, 1963. Kate is horrified by “Americans with the ability to rewrite history”…this could be a dig at the American Doctor Who movie or Torchwood season four among other things. 11 mentions he lies about his age. This nods to a few inconsistent counts through the series. Finally all the Doctors unite to save Gallifrey (which is described by 9 and 10 as “time-locked” so this may actually have already worked. They’re seen on screens along with a glimpse of Capaldi, Doctor #12, the first time a Doctor is seen on screen before his regeneration. “Hopefully the ears aren’t as prominent this time.” This nods to the fat that he will soon be Eccleston. 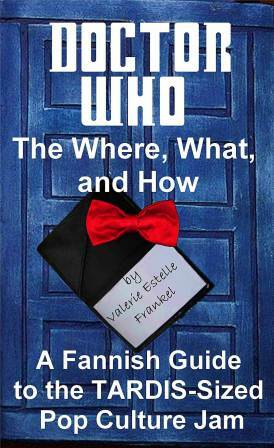 I wrote an entire book of these sort of references….available free today through Monday at http://www.amazon.com/Doctor-Who-The-What-Where-ebook/dp/B00GMWKBUE/ Doctor Who: The What Where and How. Nice read, thanks! However, “Timey Wimey” actually comes from 5 and you did miss the line “Oh you’ve re-decorated…. I don’t like it” harking back to 2. Also, sorry, it just occurred to me that you may have missed Billie Piper saying “Now he’s getting it” which is harks back to a similar line she said to Micky (“Now you’re getting it”) in series 2 of the revived series. It was used in a lot of the advertising campaigns for the DVD release. That said, in an episode packed full of homages, you spotted a hell of a lot more than I did. Well done. May I please ask why you refer to Osgood as “The Fangirl”? Oh, she just feels like a fangirl–she gushes so much while meeting the Doctor (much like the UNIT characters in “Planet of the Dead”). With inhaler and scarf, she feels like one of us. I didn’t see it mentioned anywhere else but during the opening I thought there was a conscious effort to make the policeman’s shadow on the wall look like the 1st doctor. Great post! My favourite reference was Piper mentioning the TARDIS’ “groaning and wheezing” sound. Terrance Dicks, the script editor in the 70’s and writer of numerous Target novelisations, used these exact words to describe the TARDIS in every one of his books. I also noticed the security guard outside the vault is played by Stuart Fell, who was a stuntman/monster actor in the days of Pertwee/Baker. The clamps used by 10 and Rose to hold onto the wall in Doomsday can also be seen in the vault. Osgood also mentions that the Curator gave her the scarf! And the old UNIT “Cromer Files” which are asked for Kate could reference the Brig’s comment in The Three Doctors that UNIT HQ seemed to have been transported to Cromer (and some other later references to Cromer).